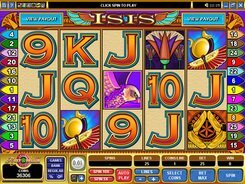 Isis is one of the oldest Microgaming’s slots that still remains a popular gaming option for slot veterans and rookies alike. Played over 5 reels and 25 win lines, Isis is all about Ancient Egyptian mythology. Fittingly, its symbols depict the Eye of Horus, a tomb, a flower and other themed symbols; these are accompanied by a set of six playing cards. A coin size lies in the range between $0.01 and $0.25, with a maximum of 10 coins accepted per line. From that, the floor and ceiling stakes are $0.01 and $62.5. The first-largest jackpot of x10,000 a bet (or $25,000 if playing at max) is granted for five Isis symbols. A scatter is perhaps the most lucrative feature in the slot, since three, four or five activate 20, 25 or 30 free games at a x6 multiplier. During the free spins you stand the chance to take away up to 600,000 coins. For even more winnings, try your luck in the gamble feature activated optionally after any winning spin.